On Chicago’s Near West Side, over one hundred students at Galileo Scholastic Academy recently taught their neighbors about the importance of renewable energy resources and the resulting environmental impacts. At the Energizing Student Potential (ESP) Energy Fair, students led hands-on demonstrations and explained complex conservation initiatives to help hundreds of community members visualize a more sustainable future. Supported by the Exelon Foundation, Galileo’s eighth grade students have become local energy experts as they have worked to master energy-focused STEM curriculum through the ESP program. ESP is designed to empower teachers in the classroom with the support and resources they need to help students explore energy-related STEM curriculum and careers. Powered by the Exelon Foundation, the National Energy Education Development (NEED) Project and other major energy providers, Galileo Scholastic Academy students have tested wind turbines, conducted energy audits, explored clean energy alternatives, and experimented with cost-saving tools, such as LED lighting and smart meters. 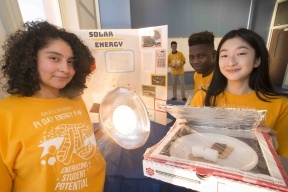 Photo Caption Solar Energy: Nylah Saldana (left), Jalien Baker (center) and Mion Fuije (right) are 8th graders at Galileo Scholastic Academy who learned how to build a solar oven with Energizing Student Potential curriculum and resources powered by Exelon. 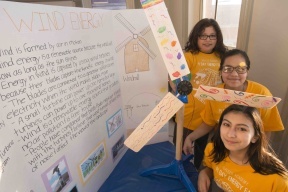 Photo Caption Wind Energy: 8th graders at Galileo Scholastic Academy teach hundreds of community members about renewable wind energy with Energizing Student Potential curriculum and resources powered by Exelon. 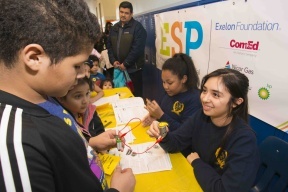 Photo Caption ESP Table: 8th graders at Galileo Scholastic Academy host a youth-led Energizing Student Potential energy fair and teach community about renewable energy sources with support from Exelon Foundation.